If you are looking for Aadhar Card Status and Eaadhar download process then you are at right page. In this article I am going to explain you about Aadhar Card Status and Aadhar Card Download online. 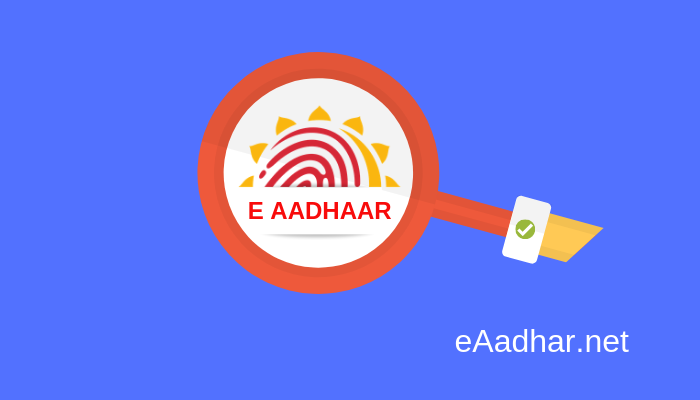 Before going to Eaadhar Download and Aadhar Card Update Status, just get a quick intro of Aadhar Card and Eaadhar. 1. What is Aadhar Card & e Aadhar? Aadhar Card is an Identification Proof for Indian Citizens issued by UIDAI (Unique Identification Authority of India). Aadhar Card Contains Aadhar Card Holder’s details just like Name, Date of Birth (DOB), Address, Mobile Number, Gender, Finger Print Data and his or her ’12 Digit’ Unique Aadhar Number. Important Update : How to link Aadhar Card to PAN Card? eAadhar is just Electronic Copy of Aadhar Card or you can say eAadhar is Digital copy of Aadhar Card in PDF format. Don’t forget that eAadhaar has the same value as equal as Original Aadhaar Card. Also, having e-Aadhaar card keeps your Aadhar information handy and minimise the chances of you ever losing or forgetting your Aadhar number. It is very common to find errors in Aadhaar cards like wrong Name, wrong address etc. The mistake might be due to a clerical error on the part of the operator due to heavy load of Aadhaar Card Application or you unwillingly providing incorrect information. In this scenario, you must update your Aadhar information as soon as possible. Read about : Aadhar Card Correction Process. Generally, after you apply for changes in your Aadhar card, it takes a few weeks for the changes to be approved by UIDAI and in dispatching of your new Aadhar card to your address. 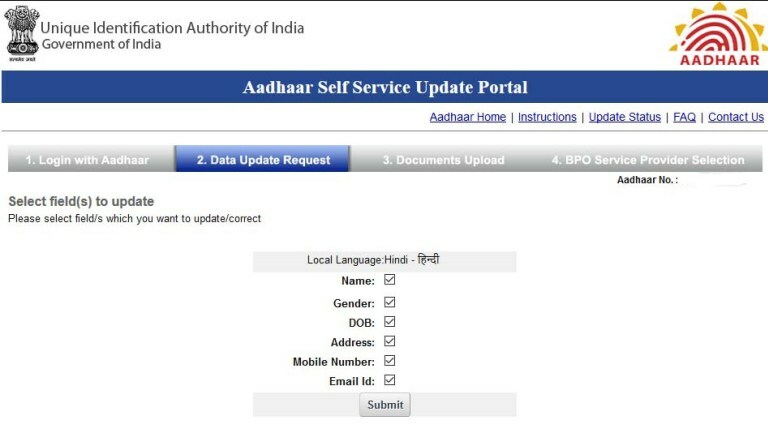 Meanwhile, you can download e-Aadhaar card through the UIDAI website with updated details, as soon as the changes are done to your Aadhar data. This way you don’t need to wait for your Aadhar card to arrive by post. Read about : Aadhar Card Update Status. After Aadhar application you have two option. First is to wait for Physical copy of Aadhar Card delivered by Post and second is to Download eAadhar card online. UIDAI (Unique Identification Authority of India) is providing a great feature of downloading Aadhar Card Digital Copy which is called E Aadhar Card. But, you can only Download E Aadhar after successfully verification of your Aadhar Application. So, you have to check Aadhar Status time to time. 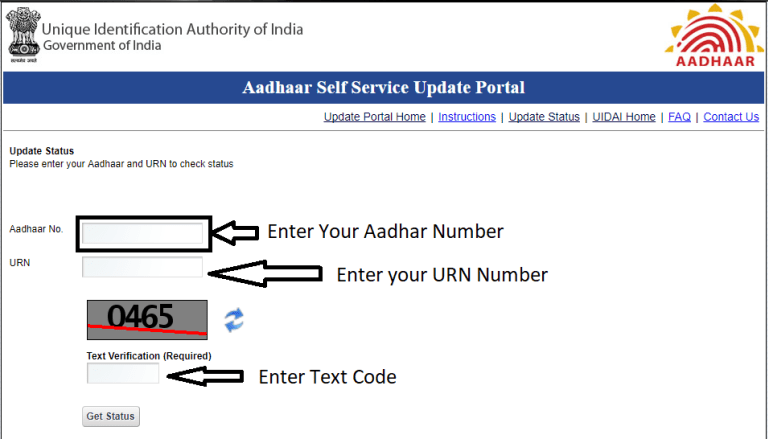 When your Aadhar Status Update completed you can download eAadhar by following below mentioned simple steps. Before that you have to be in possession of your Mobile Phone to receive One Time Password (OTP) for Verification Purpose. Note: You will get E-aadhar OTP only on your Registered Mobile Number, Which one you have Provided at the Time of Aadhar Card Application Process. Go to the official Eaadhar Portal. After going to the Official Eaadhar Website You can see the Page which look alike below given image. Now according to your selection between three options, enter your 12 Digit Aadhar Number/14 Digit Enrolment Number or Virtual ID. After entering above mentioned details, now choose if you need Masked Aadhar Card or Not. Now enter the Captcha as shown in Image. Click on “Send OTP” button to receive OTP. Within Few Second You will receive OTP on your Registered Mobile Number. Now, you need to enter this Password/OTP/TOTP/Passcode, as shown in image below. After Validation of OTP, you will get your Eaadhar in PDF File. Keep in mind that your eAadhar PDF is Password Protected and you have to unlock it to open it. 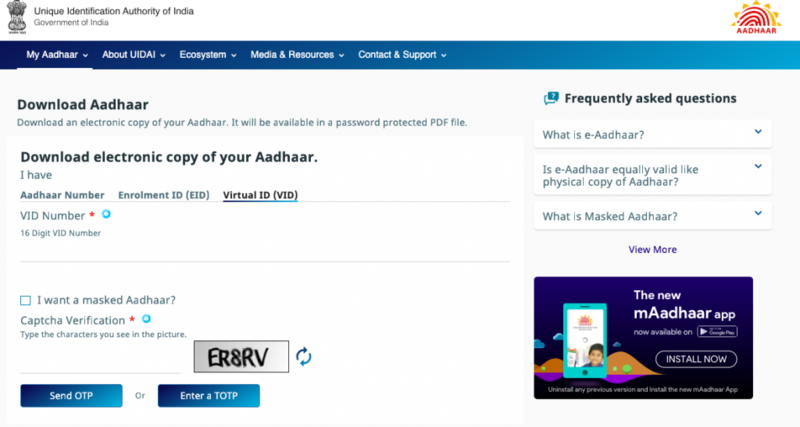 Read About : What is E Aadhar Password? Now in India importance of Aadhar Card is increasing rapidly because, Aadhar Card becomes the Primary ID for Indian Citizens. You can imagine importance of Aadhar card in India by knowing that Indian Government is making Aadhar Card Necessary to avail so many Schemes like LPG Gas Subsidy, Benefits in Awas Yojana, Bank Account & Transaction Process etc. So, If you Don’t have your Aadhar Card and not applied for then I strongly recommend you to Enrol for Aadhar Enrolment Process at the earliest at your nearby your Aadhar Card Kendra Center. After reading above few paragraphs you got some basic Idea about Aadhar Card or eAadhar. Now, in following post you are going to know about Aadhar Card Application. First of all you have to apply for Aadhar Card at your nearest Aadhar Card Center with relevant documents i.e. Passport Size Photo, Address Proof & ID Proof. Aadhar Enrolment Process take just few minutes and you will get a Enrolment receipt containing your Unique Enrolment ID. After that, it will take approximately 90 Days to receive Original Aadhar Card at home by Post. In preceding paragraphs you have learned about Aadhar Card Application, Eaadhar Download and Aadhar Update Status. Now in succeeding paragraphs you are going to know about Aadhar Card Correction at SSUP. For an instance we suppose that after downloading your E Aadhar from above mentioned method and you get to know that some of your information is wrongly filled up during Aadhar Card Application. Now in this scenario, you need to Update your Aadhar Card at SSUP (Self-service update Portal). You may need to attach some more documents for Verification. Now, I will explain the full process of Aadhar Correction. For updating your Aadhar Card at SSUP you can choose between below mentioned 2 options. 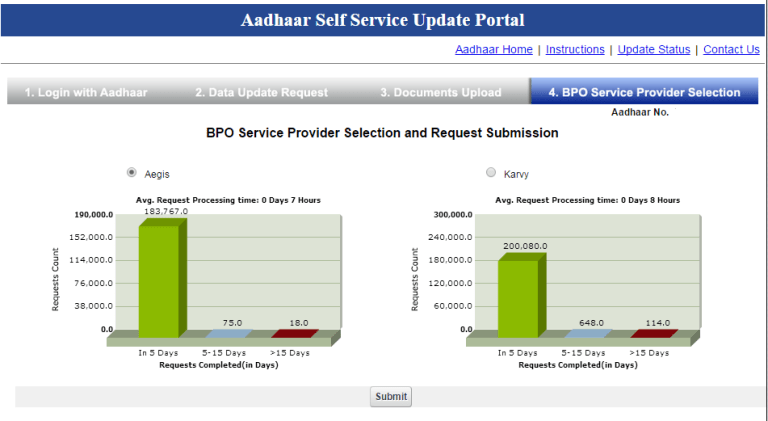 In Fifth and last step choose nearby BPO Service Provider from which you can receive your New & Corrected Aadhar Card. After completing Step 5 successfully, you will get ’14 Digit URN Number’. 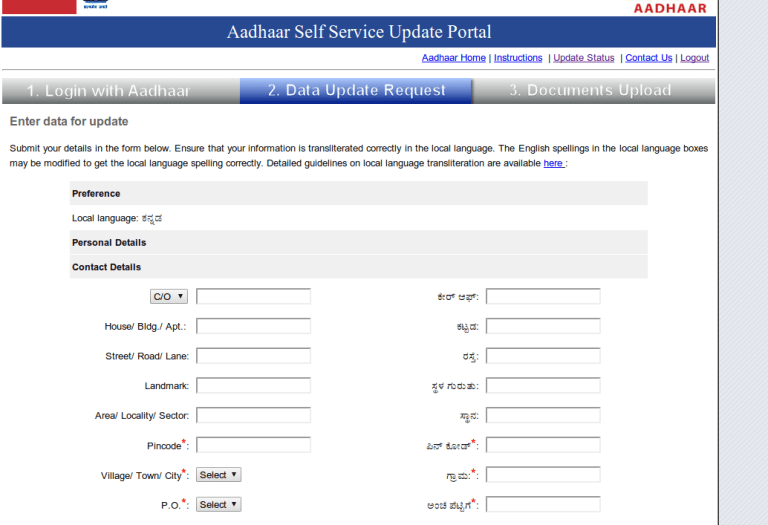 Which will help you to trace and Check Aadhar Update Status. You will also receive SMS on your Registered Mobile Number containing URN (Update Request Number). As you’ve updated your Aadhar Card by following above mentioned steps now you can track New Aadhar Card Status with the Help of URN Number. The tracking process is very simple and will take less than 5 minutes. 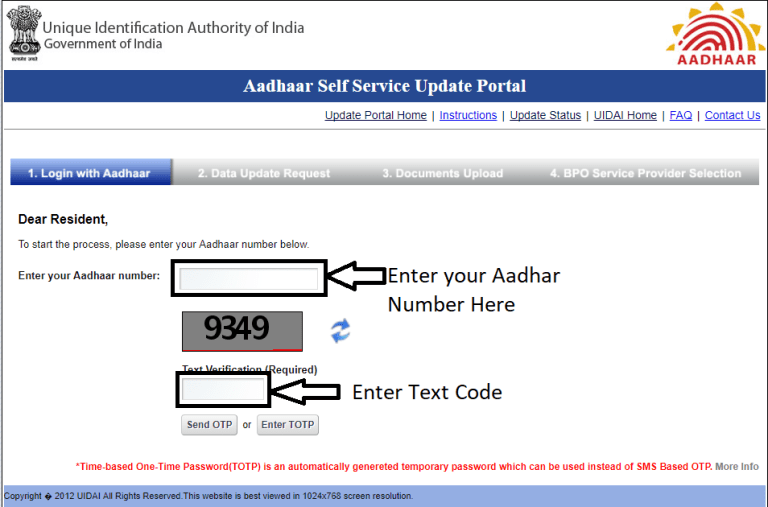 As shown in the below image enter your Aadhar number and URN Number in respective Boxes. After that enter Text Verification code given is picture and Click on “GET STATUS” button. 1. Your Aadhar Card has been Updated (You can download straight away by follwong instructions given in below image). 2. 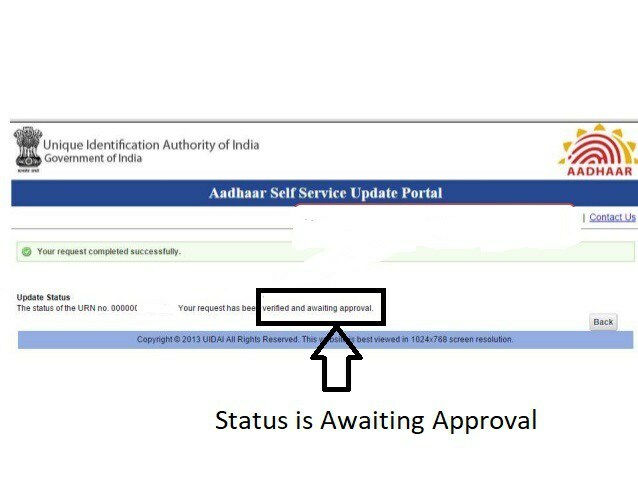 Your Aadhar Update is Awaiting Approval (You have to wait for few more days & check again). If, Your Aadhar Update Application is verified you will receive your new Aadhar Card within couple of weeks meanwhile you can also Download Eaadhar using above mentioned method. I hope you are able to Download E aadhar Card and Update Aadhar Card using Above described methods. But If you are still facing any Problem, Please Comment Down below and I will try to Solve your Problems. Note : Never Share Your Aadhar Details With Anyone.